San Francisco’s Mission District has always been a supportive place for low-income and immigrant Latinos, but it’s now one of the most unaffordable neighborhoods in the country. In fact, 8,000 Latinos have been forced from their homes in the last decade — that’s over 25 percent of this community. MEDA is using our years of experience to keep Latinos and working families in the Mission District and help them thrive. 1990 Folsom is a new development that will bring 143 units of affordable family housing to the Mission. Our project concept will transform a vacant and underutilized property into a beautifully designed, mixed-use development that will increase pedestrian and resident safety in the area by bringing eyes to the street, promote arts within the community by providing valuable Production, Distribution and Repair (PDR) space, and stabilize low-income families by connecting them to on-site child care, services and programs. MEDA and TNDC have partnered with LMS Architects to bring this project to life. 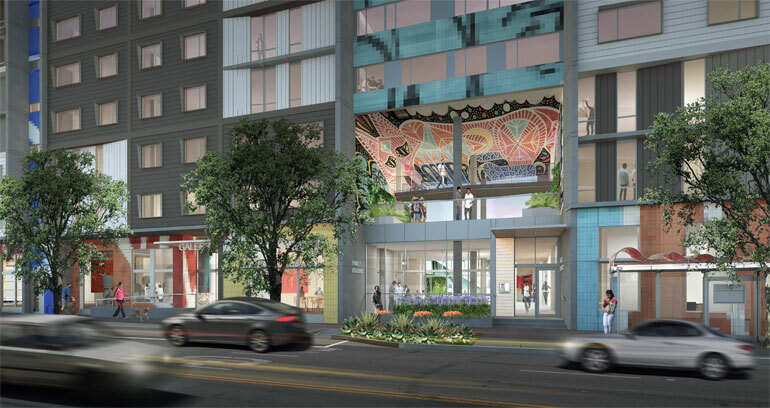 Based on feedback from the community and the City of San Francisco, the building’s unit mix will offer over 50 percent two- and three-bedroom units. Located on the site of a former bakery, 1990 Folsom respects the history of the site and brings new life to a more industrial portion of the neighborhood, by replacing and exceeding the PDR area and dedicating the new use to the arts and creative endeavors. Estimated move-in date: Q1 2021. Please reach out with any questions by emailing us at 1990folsom@medasf.org. Sign up below to receive updates on this affordable-housing development.